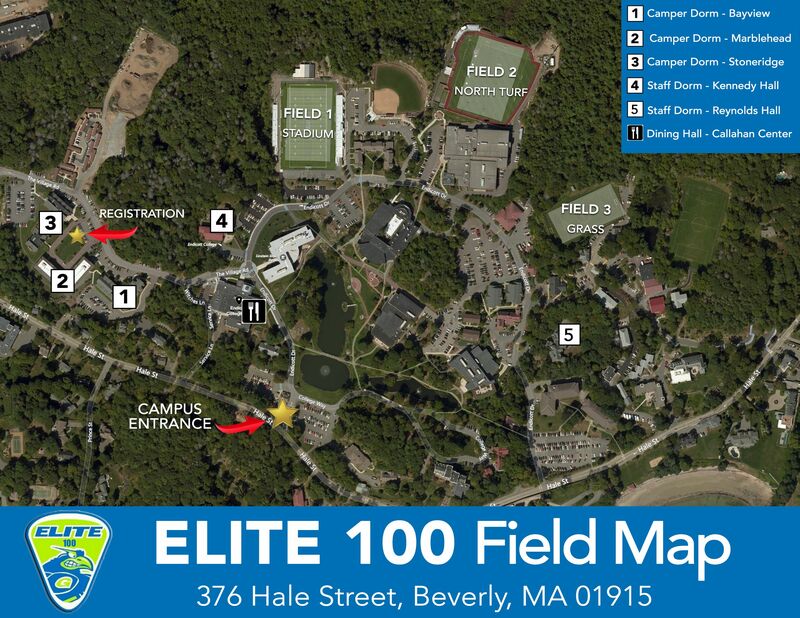 We look forward to having you attend the Elite 100 at Endicott College on August 2-4 2019(2020, 2021, 2022 and 2023 Graduates) Please be sure to read all the important information below. Check in will take place at THE POST CENTER ATHLETIC COMPLEX. After checking in you will report to your Residence Hall. Both of the residence halls are air conditioned. Check in will be between the hours of 8:30am-11:00am on august 2nd We will have staff assisting with check in and parking. Please check in first then unload at your residence hall. At check in you will receive a packet. In this packet will be your team assignment, jersey, room key and room assignment, game schedule and field/campus map. ​​​​​​ All team and roommate assignments will be given at check in. Early Check In: If you would like to check in the day before (August 1st after 300pm) you may. The early arrival/transportation form must be sent in prior to camp with the $85 fee. This fee includes dinner, housing and breakfast. Please mail in this form and payment prior to camp! The first meeting will take place at 11:30am on August 2nd in the Wax auditorium. Once you are checked in to camp you will wait at your residence hall to go to the opening meeting. Check Out: Will take place on Sunday August 4th between 12:00pm and 4:00pm depending on when your last game ends. The All Star games will be played Saturday night and will be broad casted on Lax Sports Network Live! Check out will take place where you checked in at Stoneridge and Marblehead Halls. The check out process is easy. Your room will be checked by staff, you will be issued a ticket for check out, turn in your key (receive key deposit back) and head out. Please bring all of your equipment and clothes. Three of the fields are turf and one is grass. We will have a camp store with clothing, drinks and pizza for sale at night. 1. Immunization Records, current physical (this can be dated back 2 years) from Physician. · All you can eat meals prepared by a The Endicott Dining Staff, in the air-conditioned Callahan Dining Hall. Meals begin with lunch on Friday and end with lunch on Sunday. ·All session will be played on Three Turf fields and one grass field. · Each participant should bring the following equipment: stick, helmet, gloves, arm pads, shoulder pads (Goalie chest protector), protective cup, mouth piece, cleats or turf shoes, sneakers (for turf, indoor and recreational use), plus any other optional protective equipment. Comfortable summer clothing is recommended. · Participants must provide their own bed linen, pillow, towels, toiletries, fan and alarm clock, etc. 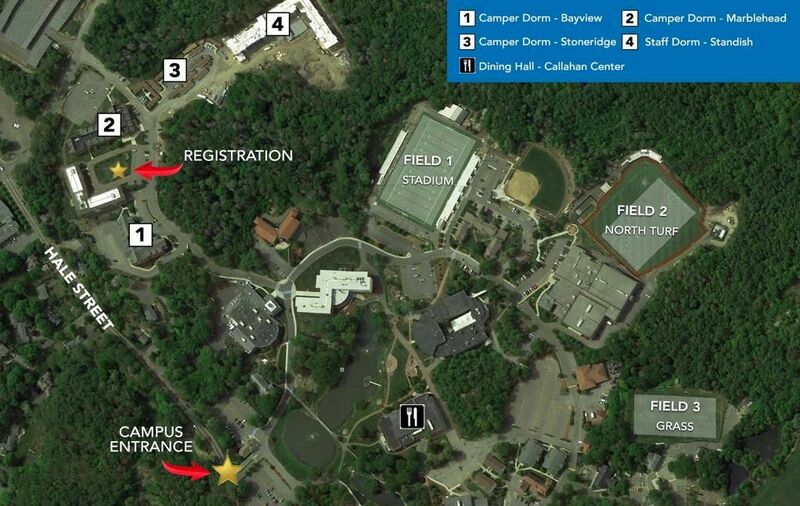 Automobiles: All car keys must be turned in to the camp staff at registration and will be returned at check out. For safety reasons you need to comply with this request. Store: Elite Lacrosse will have t shirts, hats shorts, snacks and beverages in the camp store. Pizza can be ordered at night for $10. Early arrival - Air/Train/Bus: If you plan on come by air, the closest airport is Logan International in Boston, 20 miles from Endicott College, Beverly, MA. The bus/train station is also located in Boston. Our suggested company for your transportation is North Shore Shuttle http://www.bedriven.com/. We will provide housing and food (dinner/breakfast) the night before. If you are arriving the night before please fill out the early check in form on the web-site and mail in with a fee of $85 made out to Elite Lacrosse. ·The Elite Lacrosse phone number is 978-729-4807. This number is available before and during camp. Again, we are excited to have you at the Elite 100. We believe we have the finest group of coaches that will make your experience rewarding.